The High Line was always going to be a success. But how much of one? 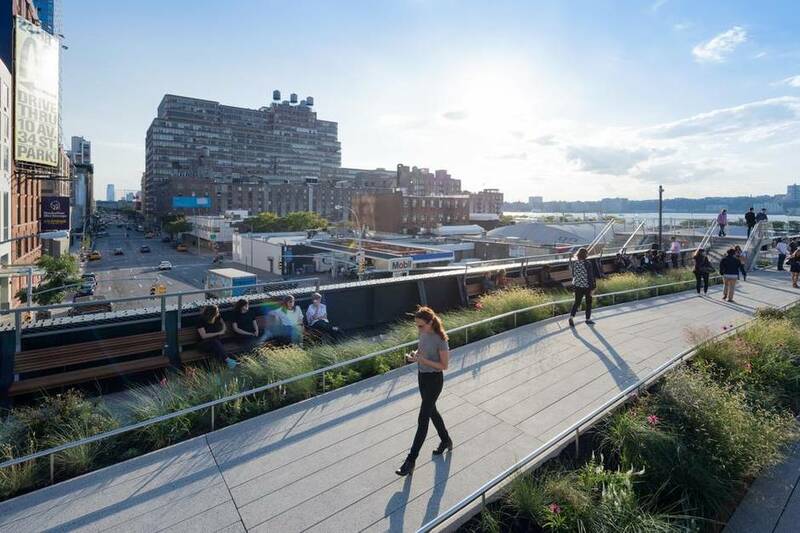 Well before the first section opened in 2009, the group behind turning an old rail line into an elevated park in New York estimated it would attract 400,000 tourists a year, and raise tax revenues by $286-million (U.S.) over 20 years. Impressive, but hardly overambitious. The final section of the 2.4-kilometre-long park was completed last month, putting the finishing touch on what has become the most successful public-space transformation in the United States, if not the world. The High Line attracts five million visitors a year, making it the second most visited cultural venue in the city. Its financial impact has been similarly massive, attracting $2.2-billion in new economic activity and raising tax revenues by an estimated $980-million over the next two decades. Now Chicago, Philadelphia, San Francisco, Rotterdam, Seoul, Toronto and Mexico City are all hoping to catch some of that magic with their own “parks in the sky.” These projects are redefining our understanding of what a park is, and in the process helping to create a richer, bold new vision of public space. The competition among cities for businesses and residents has prompted “what I call a peaceful arms war for parks – who can make the best and boldest parks?” says Benepe, director of city park development for the Trust for Public Land, a U.S.-based non-profit organization. Our understanding of what parks are and what they bring to our lives was established in the middle of the 19th century. Parks were to be places of tranquil respite from overcrowded, bustling urban centres. And no one did more to ingrain this notion than Frederick Law Olmsted, the landscape architect who designed Central Park. Olmsted believed parks could restore a sense of calm, but to do so they had to be separated from the city as much as possible, which is why his parks frequently featured thick shrubbery and trees around their borders. Parks were to be in cities, but apart from them. 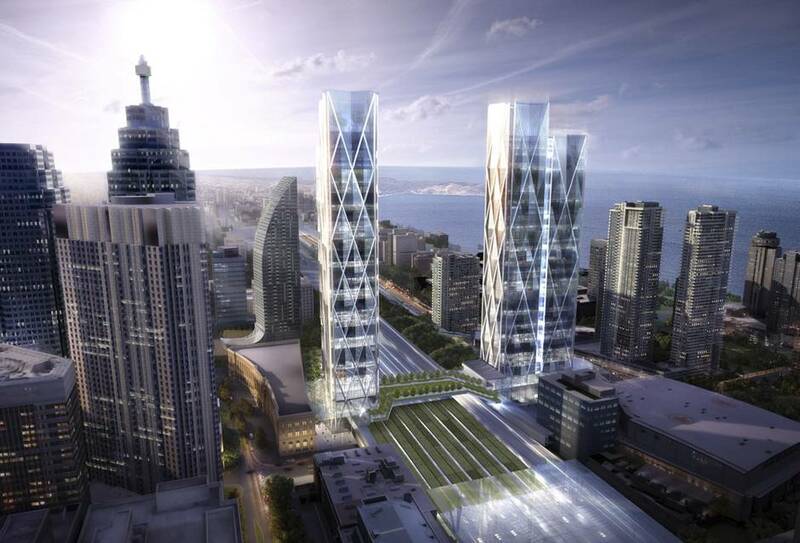 Ivanhoe Cambridge and Metrolinx announced plans to build an office and transit development in Toronto that will include a one-acre park that connects two large office towers at the fourth flour. Olmsted also believed that any great city park required a grand promenade. So-called linear parks such as the High Line take both of those two design principles and update them for the modern age. “Linear parks are dynamic rather than static; they are not peaceful retreats but ways,” writes Diana Balmori in her 2010 book, A Landscape Manifesto. In fact, they are both. As such, they provide a completely new experience of the city, one that others are hoping to emulate. 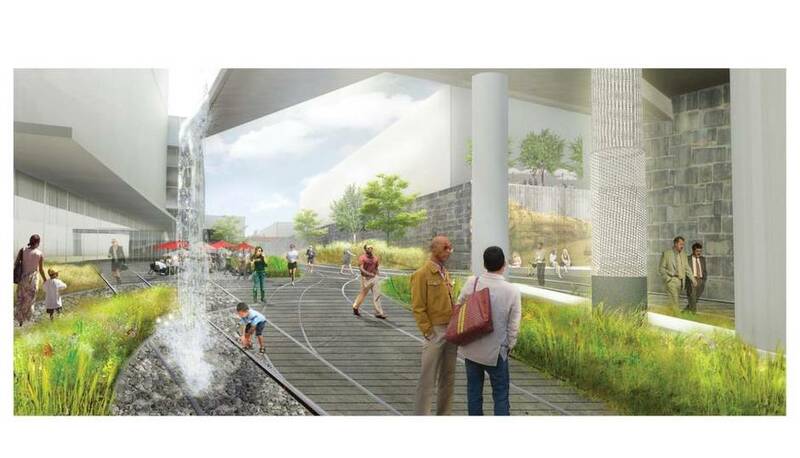 “We point to the High Line all the time as a precedent for what we’re trying to accomplish,” says Leah Murphy, president of Friends of the Rail Park, a non-profit organization advocating for a 4.8-km linear park in Philadelphia. The proposed Rail Park in Philadelphia. Like in New York, the Philadelphia project aims to repurpose a former rail line. 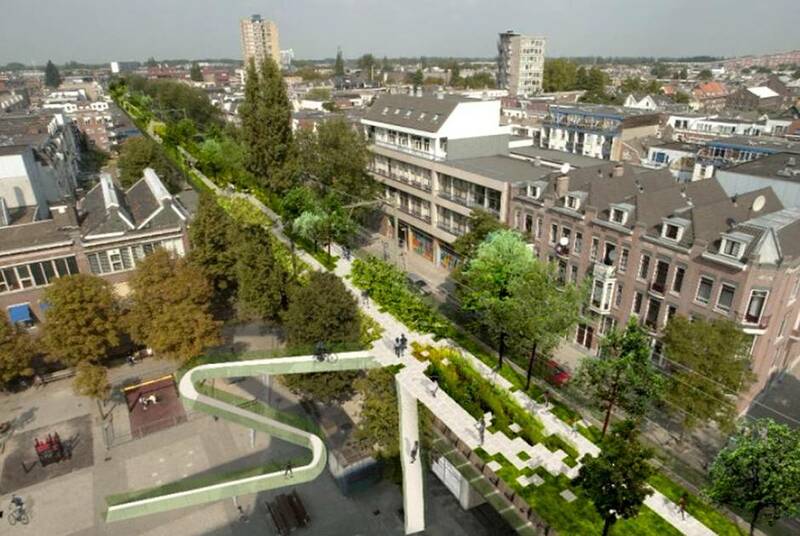 The same is true for the 606, a project currently under way in Chicago, as well as a project to redevelop train tracks that run through downtown Rotterdam into an elevated park. But not every project inspired by the High Line is following that exact blueprint. Clearly, there is great appeal in putting parks above street level. The mayor of Seoul last month announced plans to turn an elevated roadway adjacent to the city’s main transit terminal into a park by the end of 2016. Earlier this week a project called “Skypark” was announced. The one-acre park will connect two 48-storey office towers at the fourth flour. Mexico City’s Public Space Authority was so taken with the High Line that it allocated $4.3-million to build a brand-new elevated path to connect a metro station to the city’s largest park. “Mexico city just needs – within so many streets, so many avenues – respite like this,” Daniel Escotto Sánchez, general co-ordinator for the Public Space Authority, told Fox News Latino in 2011. San Francisco is constructing a park on the roof of a bus and rail station. San Francisco is in the midst of creating an even bolder park in the sky. 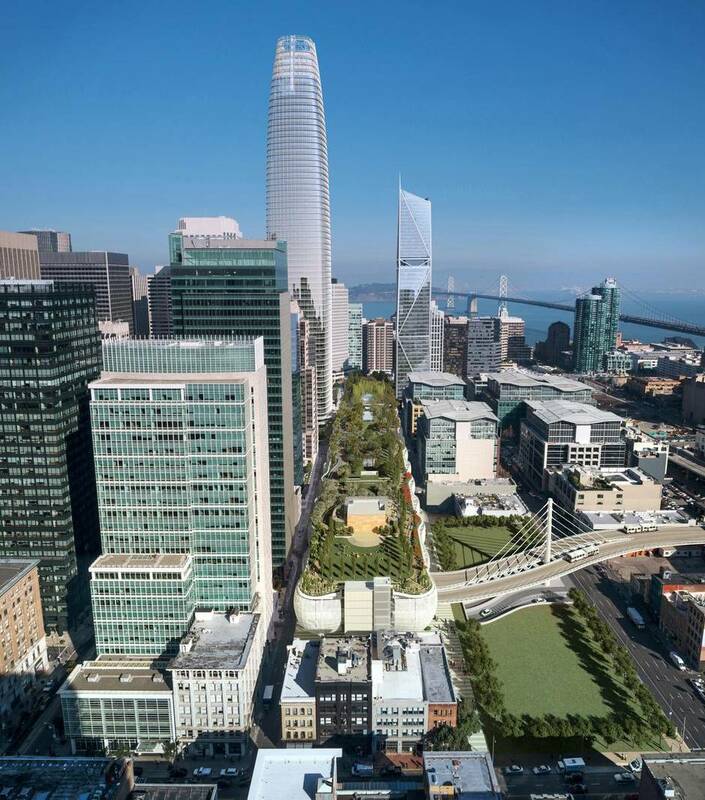 The new Transbay Transit Center, currently under construction near the city’s financial district, will include a 5.4-acre park on the roof of the bus and rail station. The park will include an amphitheatre, a restaurant, café, a walking and jogging trail around its perimeter as well as a children’s playground, among other features, says Scott Boule, the project’s legislative affairs and community-outreach manager. “We certainly think that not only is this park going to be beautiful and have really significant amenities, but it is going to be unique, and we expect that will be a major attraction,” Boule says. The novelty of these projects is no doubt part of their appeal. We’re used to seeing parks on ground level, not four storeys above the street. But that in no way guarantees their success. The Promenade plantée, the elevated linear park built on a former rail line in Paris in 1993, hasn’t received nearly the attention or enjoyed the same success as the High Line. But the projects currently under way are proof not only of new ways of thinking about parks but about what it means to live in and experience a city. We no longer have to be separate and static or immersed in the city and stressed by its rushed pace. With enough bold thinking we can have a totally new experience of the city, simultaneously connected to it and above it.